Another Canadian Tuxedo by Rowe!!! Thank you Maren Roth for styling us yet another DOPE Canadian Tuxedo! This time on fellow Bexley native Sydney Meyer. 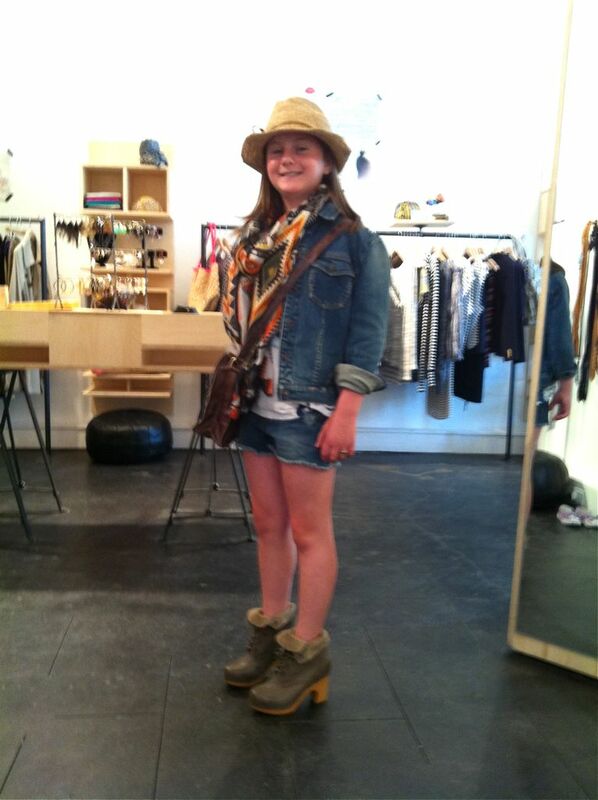 Rowe Boutique owner Maren dolled her up in Genetic denim jacket and cut offs, Jeffrey Campbell clog boots, Hat Attack raffia hat, We Are Owls aztec scarf and Jesslyn Blake leather crossbody bag. How adorable is this tween? So fashion forward at such a young age! We LOVE! If you love any of these looks, you can always order them on the Rowe Facebook page. This entry was posted on Saturday, June 11th, 2011 at 3:43 pm	and tagged with Canadian Tuxedo, Denim, Genetic, Hat Attack, Jeffrey Campbell, Jesslyn Blake, Rowe, Rowe Boutique, We Are owls and posted in Fashion. You can follow any responses to this entry through the RSS 2.0 feed. It’s extra DOPE that she’s from Bexley. Go Lions.